by the FAO Regional Office for Africa. All right reserved. No part of this publication may be reproduced, stored in a retrieval system, or transmitted in any form or by any means, electronic, mechanical, photocopying or otherwise, without the prior permission of the copyright owner. Applications for such permission, with a statement of the purpose and extent of the reproduction, should be addressed to the Director, Information Division, Food and Agriculture Organization of the United Nations, Viale delle Terme di Caracalla, 00100 Rome, Italy. 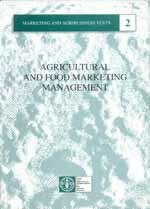 This textbook, Agricultural and Food Marketing Management, was prepared by staff of the Network and Centre for Agricultural Marketing Training in Eastern and Southern Africa. The Centre had the objective of strengthening agricultural marketing training in Eastern and Southern Africa. It was funded by the Government of Japan and executed by the Food and Agriculture Organization of the United Nations. Based in Zimbabwe, but also serving Kenya, Malawi, Tanzania and Zambia, the Project was able to draw upon the collective experience of eminent academics, government policy markets, experienced managers in agricultural marketing parastatals and pragmatic entrepreneurs from the private sector of agribusiness. The Project extended over a five year period, from May 1990 to August 1995, and during that time amassed a wealth of information on marketing practices with in the food and agricultural sectors with in the Sub-Saharan. In the first instance, this information was published, by the Project, as a series of proceedings, from workshops, and teaching manuals written by regional and international experts in the twin fields of food and agricultural marketing. Marketing Research And Information Systems. These texts are primarily designed as an aid for those teaching marketing as it applies to food and agribusiness. The material is therefore relevant to students of agricultural marketing, agricultural economics, agribusiness, management and business studies They are suitable for undergraduate and postgraduate degree courses, as well as vocational and in-service short courses. Chapter objectives - an outline of its objectives in terms of what the reader can expect to learn from reading the particular chapter. Chapter summary - a summary which encapsulates the main points of the chapter. The summary should prove useful to students wishing to quickly revise the topics within the chapter. Key terms - the most important terms are listed at the end of each chapter and are intended to act as an aide-memoire. Review questions - each chapter concludes with a series of questions which readers can use to test their knowledge of the material contained with in the chapter. References - other works upon which the author has drawn in writing this textbook are fully referenced as an aid to students seeding to extend their knowledge of a given topic. Glossary - at the end of the textbook their is a ready reference to the most important terms and concepts. The glossary should prove especially useful to those readers who are new to the subject of marketing since it gives a brief explanation of these terms. The text is complemented by an additional set of learning and teaching aids. These include a tutor's manual and a set of overhead transparency masters. The author wishes to acknowledge the contribution of Ms. Sophie Tsoka who was responsible for the design and production of the visual material both in this textbook and the accompanying overhead transparency masters. Thanks are also due to Mr. Edward Seidler and Mr. Andrew Shepherd of FAO for their critical review of earlier drafts of the text. Lastly, the author takes this opportunity to express his gratitude to Kathryn Greenhalgh, Margaret Bowler and Diane Wallace for their painstaking work in proofreading the draft manuscript.